The GLP impression X4 L offers a full package of a pixel mapping LED luminaire with an extremely fast zoom operation from 7° to 50° degrees. An additional feature for the X4 L is an inbuilt accessory holder that can both set an indexed position or rotate continuously.Built to house beam shapers and other effect filters, this option adds an extra level of versatility in beam control. For the color system, the X4 L houses 37 high power RGBW LED’s. With their quad color technology and 15 Watt power, they provide both a broad color pallet and a crisp high intensity output. 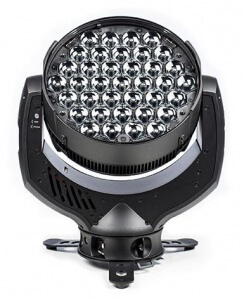 Rounding out its’ comprehensive feature set, the impression X4 L offers smooth full range dimming – with no color shift, electronic strobe functionality, variable color temperature correction, and 16 bit pan and tilt control all in the sleek baseless design that has become a part of the GLP impression product range.